What is wanted here is silence. That the young woman is pregnant is suggested by her unlaced gown, shorter in front than in back. Her labor has begun, and her right hand both indicates her pregnancy and feels the movement of the contraction, while her other hand presses into her back to relieve the discomfort. She has moved deep within herself into silence. The angels, mirror images, their colors inverted, are closing the tent to give her privacy. 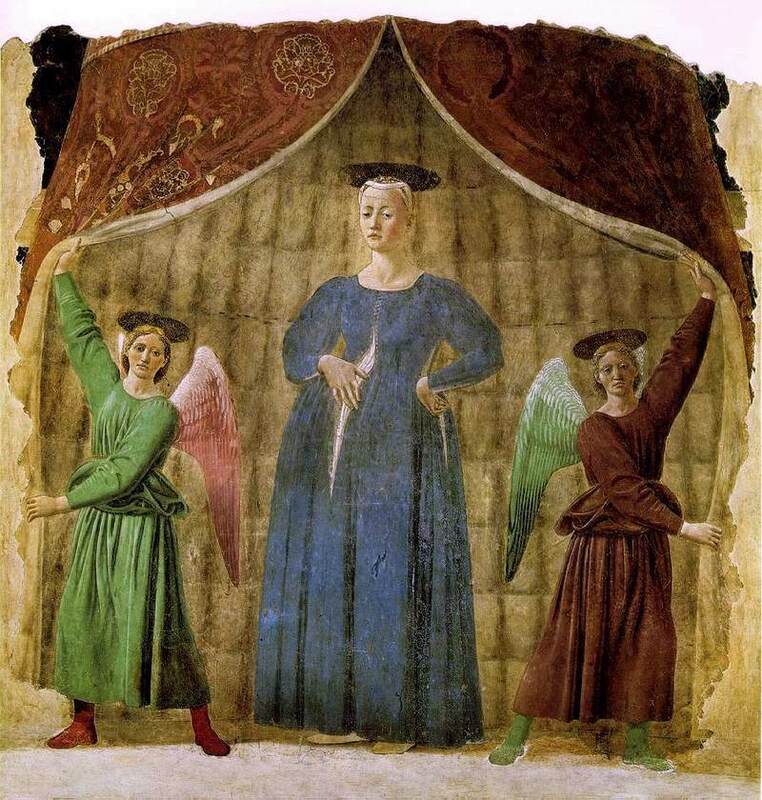 Inevitably these angels are described as pulling back the curtains to reveal her: this would be the convention, and innumerable putti pull back draperies to uncover lovers or other important events. But Piero is never conventional when he follows conventions, and an understanding of the young woman's posture and the way in which they shield her with their wings makes it clear that they are protecting her, giving her privacy. This tent, though is even less conventional. Exodus 25-26-27 describes the making of the tent of the Ark of the Covenant. Piero gives us an imperial tent of his day and here the red-dyed rams' skins and the gold of Exodus have become heavy red brocade woven with gold roses. Where Exodus constructs the tent of skins, Piero lines the young woman's enclosure with fur. The King James Version reads the skins as badger skins, but the word may actually refer to sealskins (there were and are seals in the eastern Mediterranean), and Piero's furs have that softness. So this young woman standing in the Tent of the Ark of the Covenant, flanked by two angels as was the Ark, becomes herself the Ark and the Covenant will be present among us this winter night in the protective quiet and warmth of the enclosing fur. The first chapter of the Gospel of John, which nearly every church will read tomorrow night at midnight or Sunday morning, says, "And the Word became Flesh and pitched his tent -- ἐσκήνωσεν --among us." Translators make that say that he lived, or dwelt with us. But John meant what he wrote: the tent of the Ark of the Covenant was pitched in our midst, and Piero has taken John's words and translated them into fresco. but there's no one royal here. The poem is by Linda Pastan, from A Perfect Circle of Sun. A larger version of the painting.